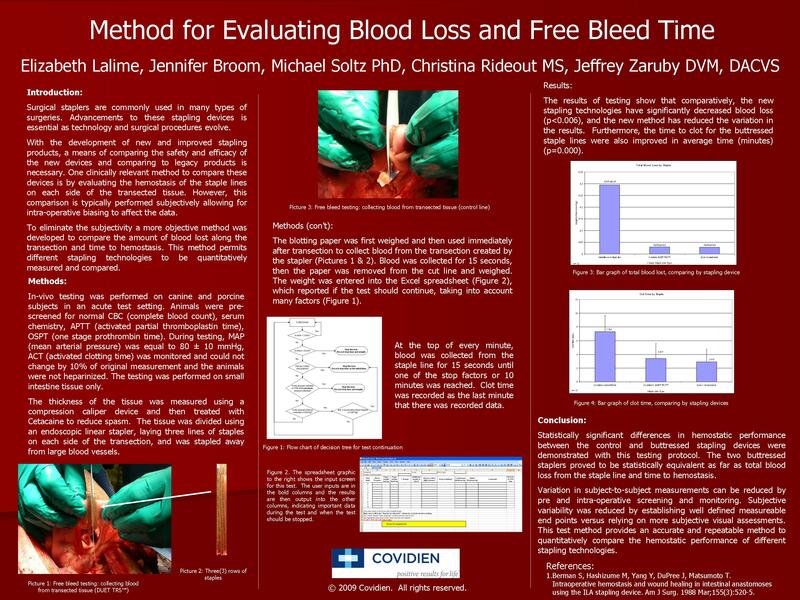 Objective: To develop a quantitative in vivo test method for measuring acute blood loss and time to hemostasis in order to assess the hemostatic performance of investigational linear stapling and dividing devices. Methods: All animals were screened pre-operatively for clotting sufficiency. Pertinent vital parameters were also controlled within narrow limits during testing (MAP = 80 ± 10 mmHg, ACT not changed by 10% of original measurement). Linear stapling and dividing devices were deployed in standard fashion in vivo in a variety of gastrointestinal tissues. Immediately after firing, pre-weighed absorbent paper was used to absorb blood from the divided edges of the stapled tissue. The blood soaked paper was weighed on a calibrated digital scale (to within ± 0.005 gram) and imported into a spreadsheet. Serial measurements were taken every 60 seconds, for a 15 second time period, until the amount of bleeding was less than or equal to 5% (by weight) of the previous weight. A decision tree embedded within the spreadsheet identified when the amount of staple line bleeding had fallen below the designated cut off point. Preliminary results: Statistically significant differences in hemostatic performance between the control and developmental stapling devices were demonstrated with this testing protocol. Conclusions: Variation in subject-to-subject measurements can be reduced by pre and intra-operative screening/monitoring. Human error can also be reduced by quantitatively defining end points versus relying on more subjective visual assessments. This test method provides an accurate and repeatable way to quantitatively compare the hemostatic performance of different stapling technologies.